Hydraulic fracturing is the injection of fluids under high pressure to crack or fracture the rock to allow oil and gas to flow into the wellbore. The natural gas or oil can then flow to the surface under controlled conditions through the wellhead and be collected for processing and distribution. Once the rock is fractured , proppant, usually sand, is usually injected to prop open the fractures . Otherwise, the fractures would close and seal themselves. 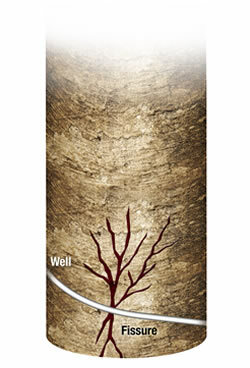 Carrier fluid, often water but also gas or oil based systems, is used to carry the sand into the fractured rock matrix. Chemical additives, in very small quantities, are used in drilling and completing these wells. They serve many engineering reasons e.g. to protect the wellbore, to facilitate drilling longer horizontal lengths, or to alter water properties to support transporting sand greater distances.